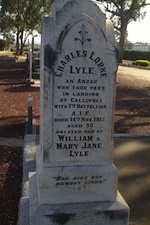 Charles was born in Bacchus Marsh, VIC in 1883 to William Lyle(3) and Mary Jane Stephens. Courtesy of Carol & George Judkins. Charles was a farmer around Bacchus Marsh, VIC when he enlisted in the AIF, 7th Battalion, E Company on the 24th of August 1914 - just two weeks after war was declared - aged 32. He embarked aboard the HMAT A20 Hororata in October, disembarking in Egypt in December. On the 25th of April 1915 Charles landed at Gallipoli(4). In August Charles was admitted to the 15th General Hospital, Alexandria - chronic asthma/bronchitis, caused by exposure. Later that month he was transferred back to England for climate reasons but in November embarked for Australia aboard the A54 Runic, returning to Australia in December. Examined in January 1916 he has reportedly suffered no further attacks although a chest examination can not be done due to his having broken his arm. In April he was declared permanently unfit, incapacity nil. On the 21st of July A PUBLIC WELCOME will be tendered (5) at the Mechanics' Institute, Bacchus Marsh which he would have attended. Charles was discharged from the AIF in May 1916. Charles died at Heidelberg Military Hospital in November 1917, aged 35. He is buried in Maddingley General Cemetery, Bacchus Marsh, VIC. He is listed on the Roll of Honour for Bacchus Marsh, held by the RSL at Bacchus Marsh. William Lyle was a JP and his father, John, was the original owner of the Underbank area and co-builder with James Young of the Border Flour Mill.